Unlike the weather, as in Mark Twain’s famous quote, “Everybody talks about it, but nobody does anything about it” fiber is different. Everybody talks about it and there is plenty we can do about it. Following is what the Academy of Nutrition and Dietetics has to say about it. Fruits, vegetables, beans and whole grains all contain dietary fiber, a type of carbohydrate that provides minimal energy for the body. Although the body can’t use fiber efficiently for fuel, it’s an important part of a healthy eating plan and helps with a variety of health conditions. Heart disease: Fiber may help prevent heart disease by helping reduce cholesterol. Actually yesterday was my second day of using the one meal a day (OMAD) intermittent fasting protocol. In two days I lost 4 pounds, had lots of energy, and ate a couple really big meals. So I was pretty determined that after I had fasted for 23 hours I was going to make sure I got in a lot of calories. The first day I ate just about anything without regard to the quality of the food, but the second day I was more selective having fish, lima beans, almonds, some high protein peanut butter, and a small plate of raw vegetables. Well now it is Monday and I’m back to my 18:6 protocol, which is 18 hours of fasting and then eating lunch and dinner. The reason I did not continue with OMAD has more to do with being social and wanting to eat lunch with my co-workers than any real major downside to a 23 hour fast. Overall I would rate my OMAD experience as a very positive experiment, one that I will probably do on weekends to stay trim and enhance the cleansing effect of fasting. To be honest I got pretty hungry after 20 hours or so, and I often felt cold, but my energy levels were high and my mood was very good. The only concern I would have and this may not be a big deal since my experiment only lasted two days is losing 4 pounds. I would worry that if I did this daily I might not be able to take in enough calories to maintain my weight. As I mentioned my energy levels were high, allowing me to do yoga in the morning, weight training in the afternoon, and I even got in a 3 mile walk the first day when the weather permitted. Remember this doesn’t have to be an all or nothing proposition, like me you might decide it just doesn’t fit into your lifestyle during the week to skip lunch with your friends or co-workers. Don’t agonize over it; you can always go back to OMAD on the weekend. I just might try something a bit more radical next weekend like a 48 hour fast and see what happens. Sorry I can’t help myself. When I refer to workout in the title of this post, I am specifically focused on strength training. There are many supplements you can take after a strength training workout, but I am going to focus on 5 that can help boost your recovery and increase testosterone levels. After working out your muscles are needing some carbohydrates and amino acids to start the muscle building recovery process. Update to my original post: There is some evidence to suggest that you might want to wait 60 – 90 minutes after a workout before consuming post workout supplements. It appears that if you worked out in a fasted state that after your workout your body will actually increase the amount of human growth hormone (HGH) and testosterone as long as you don’t consume anything other than water right after your workout. So my updated advice is to wait about an hour after your workout before taking the supplements mentioned below. This will give you the opportunity to take advantage of spiking HGH and testosterone levels, thus maximizing your gains. Branch Chained Amino Acids (BCCA) – There are three BCAAs: leucine, isoleucine and valine. The BCAAs are among the nine essential amino acids for humans, accounting for 35% of the essential amino acids in muscle proteins and 40% of the preformed amino acids required by mammals. BCAAs not only increase the rate of protein synthesis, but they also increase the cell’s capacity for protein synthesis. BCAAs also work in your favor by reducing the rate of protein breakdown. They might also help improve workout intensity, that is why BCCA’s can be used as a pre workout and post workout supplement. Creatine Monohydrate – is a natural substance that turns into creatine phosphate in the body. Creatine phosphate helps make a substance called adenosine triphosphate (ATP). ATP provides the energy for muscle contractions. Creatine will pull water into the muscle cells, and effects the ability for your body to use fast twitch muscles. Note: your body can only store so much ATP so taking more creatine than advised will not be effective. The ideal dose is around 5 grams (1 heaping teaspoon). Creatine can be used as a pre-workout and/or post-workout supplement. L-Arginine – is a naturally occurring amino acid that may help to increase blood flow (in some populations) and anabolic growth-hormone secretion. This helps increase lean muscle mass/strength/power, promotes faster recovery from exercise, and improves the work capacity of active muscles. L-arginine also improves the process of clearing waste products from your muscles. This may result in a reduced sense of fatigue. I like to use about 2.5 to 3 grams after a workout. L-Glutamine – is the most abundant inessential amino acid in the human body and makes up the majority of the amino acids in skeletal muscle. Despite being involved in many crucial roles in our daily health and function, it’s considered “inessential” because the body is capable of producing it on its own. L-Glutamine plays a big role in supporting workout and muscle recovery, enhances immune function, and improves intestinal health. For me it seems to assist in helping my muscles recover and I have less next day soreness. I would use about 5 grams after a workout. Tribulus terrestris – is a flowering plant that grows in temperate and tropical areas. The compound is rich in saponins, the active ingredient claimed to increase the body’s natural testosterone levels and helps to build muscle. The primary point of the tribulus terrestris extract is that it will increase testosterone levels. It does this in a very secure method – by no means exceeding the physique`s natural upper limits. I have read that it is best to take on an empty stomach after your workout. I usually take about 1 to 1.5 grams after a workout. Either use a fruit drink or some powdered post workout drink (even Gatorade would do) to mix with the powdered BCCA’s, Creatine Monohydrate and powered L-Glutamine. Once mixed, drink and swallow your Tribulus Terrestris and L-Arginine capsules. Wait 20 to 30 minutes before eating. This gives the post workout supplements some time to digest and get into your blood stream before you consume anything else. The reason I advocate that you use a fruit drink or something like Gatorade is that following a workout is the best time to consume sugar. When you train, your body burns glycogen, or sugar. Both blood sugar and muscle glycogen are consumed during a workout, and to recover, as well as progress, you need to restore depleted glycogen levels as quickly as possible. My next step is to follow the post supplementation with a meal that contains a decent amount of protein and some complex carbohydrates. The only warning might apply to women taking Tribulus terrestris. I would do some additional research on the effects it may have on women before adding it to your post workout supplements. I would love to hear what kind of post workout supplements you advocate taking. 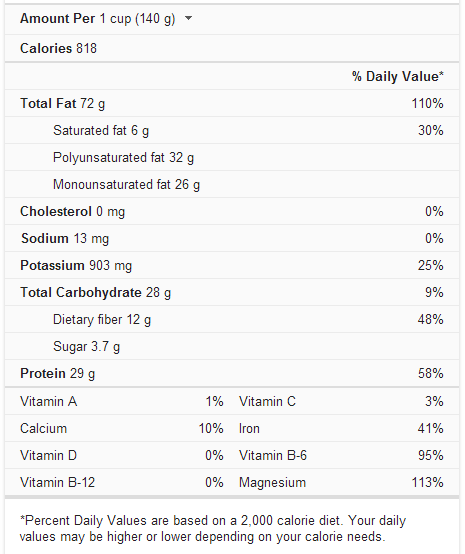 As you can see Sunflower seeds are relatively high in fat, but also include a generous amount of protein and some fiber. Low in Cholesterol and Sodium. A good source of Thiamin and Vitamin B6. High in Magnesium which studies have shown that magnesium helps reduce the severity of asthma, lower high blood pressure, and prevent migraine headaches, as well as reducing the risk of heart attack and stroke. Also contains Phosphorus, Copper, and Manganese. High amounts of Selenium. Selenium has been shown to induce DNA repair and synthesis in damaged cells, to inhibit the proliferation of cancer cells, and to induce their apoptosis, the self-destruct sequence the body uses to eliminate worn out or abnormal cells. A very good source of Vitamin E (Alpha Tocopherol). Vitamin E has been shown to be good for your hair and skin, and contains antioxidants that remove free radicals that damage cells. Now while the sunflower seed has a substantial fat content and is fairly high in calories, its many health benefits make it a great addition to just about anyone’s diet. This is a calcium rich nut that is great for your bones especially if you have eliminated dairy products from your diet. Almonds have a high amount of vitamin E making them good for your skin, and the outer skin on the almond has flavonoids that help protect your heart. Nutritional Data: 1 ounce (23 whole nuts) of raw almonds contains 6.02 grams protein, 14 grams of fat, 163 calories, and 3.5 grams of dietary fiber. A great source of protein they are also rich in iron and zinc, which makes cashews a great choice if you’re following a vegetarian diet. Containing generous amounts of the mineral magnesium, which is thought to improve recall and delay, age-related memory loss. Nutritional Data: One ounce of raw, unsalted cashew nuts contains 5.17 grams of protein, 13 grams of fat, 157 calories and 0.94 grams of fiber. Surprisingly the lowly peanut rivals many of the most nutritious nuts chosen by the USDA. This nut is heart-healthy overall, and contains resveratrol, the same flavonoid sought from red grapes and red wine. Peanuts have the highest amount of protein, the third least calories, and the absolute highest amount of Folate (folic acid), a water-soluble B-complex vitamin that is rare in nuts . Nutritional Data: One ounce of dry roasted peanuts contains 6.71 grams of protein, 14 grams of fat, 166 calories and 2.3 grams of dietary fiber. The pecan is a heart-friendly nut that is packed with plant sterols, valuable compounds that are effective at lowering cholesterol levels. Pecans are also have high levels of antioxidants which helps prevent the plaque formation that causes hardening of the arteries. The pecan is also rich in oleic acid, the healthy fat found in olives and avocado. Nutritional Data: One ounce (19 halves) of raw pecans contains 2.6 grams protein, 20 grams of fat, 196 calories and 2.7 grams fiber. Packed with antioxidants,and are the only nut that skyrockets in lutein and zeaxanthin, the only two carotenoid antioxidants that accumulate in the retinas of our eyes. Pistachios also have the most selenium, an anti-inflammatory trace element that aids our immune systems and helps prevent viral infections and cancer. While I love all of these nuts this is by far my favorite just because it tastes so good. Nutritional Data: One ounce of dry roasted pistachio nuts (no salt) (49 kernels) contains 6.05 grams of protein, 13 grams of fat, 162 calories and 2.9 grams of dietary fiber. With their superior antioxidant content walnuts are useful in the fight against cancer. A good source of mono-unsaturated, heart-friendly fats, and studies show they help to lower the bad form of cholesterol (LDL). The Walnut is also rich in omega-3, so they’re a great alternative if you don’t eat oily fish. Nutritional Data: 1 ounce (14 halves) English walnuts contains 4.32 mg protein, 18 grams of fat, 185 calories and 1.9 mg fiber. While there are differences in the nutrients derived from these nuts, there is also a many similarities and they all provide a healthy dose of potassium and phosphorus, generous amounts of protein, the good kind of fat, and much needed fiber. So instead of reaching for that bag of chips or bowl of ice cream, grab a handful of cashews, almonds, pecans, pistachios, walnuts, or peanuts. You will feel so much better about what you are putting in your body, and you will find nuts are both a delicious and satisfying treat.